Victoria's Minister for Emergency Services, the MFB and CFA confirm an approximately $41 million cut to the CFA's budget and $25 million cut to the MFB's. More cuts are to follow down the track. Links to selected firefighter workplace, industrial, technology and OHS news stories. Victorian State Minister for Emergency Services Peter Ryan, MFB CEO Nick Easy and a CFA “spokesperson” confirm budget cuts of approximately $41 million for the CFA and $25 million for the MFB, with further cuts forecasted in following years. Firefighting funds to be slashed. Union claims Baillieu government about to slash millions from fire services. Budget cuts affect Vic firefighting: Union. New CFA jobs delayed by budget cuts. Queensland firefighters have been tied to their desks by a 'dog' of an IT system that has proved a multi-million-dollar money pit for the QFRS, insiders say. A report on bushfire risk by a South Australian Parliamentary committee has warned of poor safety standards for many homes in areas devastated by the Ash Wednesday fires of 1983. The bushfire season forecast from firefighters is bleak. Queensland Fire and Rescue Service area commander Simon Ball said a high volume of dead tree limbs, dry grass and leaf litter was concerning. 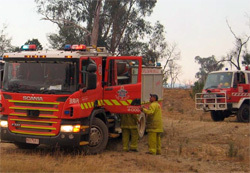 Rural firies could face further cuts. Bushfire educators face the axe. Minister gives assurance on staff for fire season. A Fire and Rescue NSW spokeswoman said a small number of stations in Sydney could be "taken offline temporarily when less than four firefighters are available due to staff absence". North-west residents will fork out an extra $100 a year for their council rates to help fund Victoria's firefighting services under one of the biggest shake-ups of state taxes in decades. Nine firefighters from Australia and New Zealand are joining Los Angeles County fire crews to get a first-hand look at tools and techniques being used to battle a blaze northeast of Los Angeles. The Fire Service ... has made it clear they have no need now for certified/trained BA Technicians, as maintenance is to be contracted out to Drager. The Philadelphia firefighters' union has filed an unfair-labor-practice charge against the city in an effort to get audio recordings and written reports from an April blaze that killed two firefighters in a wall collapse. Authorities have requested European Union assistance in fighting forest fires, which have spread across the central and northern parts of the country. A recent fire in the 42 story Polat Tower in Istanbul was eventually contained by helicopters and firefighters working from the ground, as was a blaze in April at the Federation building in Moscow. Republican presidential nominee Mitt Romney has told the Fraternal Order of Police (FOP) that "I will oppose" expanding collective bargaining rights for public workers if he wins the White House.